In the depths of winter, it seems like fresh, local produce is a distant memory. Not so! With the help of hoop houses and root cellars, we can munch on the fruits of our neighboring farmers' labor right through February. We're still getting regular deliveries of carrots, parsnips, cabbage, potatoes, rutabagas, celeriac, onions, garlic, beets, and - when we're really lucky - fresh greens from some of our favorite farms including the Vegetable Ranch, Brookford Farm, and Snow Dragon Mountain Farm. For this blog, I hope to inspire you to bring home some of the lesser-known root veggies. We all know and love potatoes. They are, indeed, the most abundantly consumed vegetable in the country. We eat about one potato per person per day, and fried potatoes make up nearly 50 percent of the total vegetable intake for children alone (yikes!). My blog on The Humble and Amazing Potato remains the most-read post on the Co-op Buzz Blog thus far. Certainly there are more healthy and less healthy ways of eating your 'taters, so I'll give our Co-op community the benefit of the doubt here. Sweet Potatoes: Sweet potatoes are the easy-pick "gateway" vegetable for finicky eaters. You can use them almost like a regular potato, but they're sweeter and more colorful. Dr. Sam Sanzone - a big fan of sweet potatoes - recently ran some comparisons during our Kitchen on a Mission cooking series. Both types of potatoes have similar calorie and macronutrient content, but sweet potatoes are lower on the glycemic index, deliver a whopping 380% of your daily value of vitamin A, and offer more than double the vitamin C content of a white potato. Dr. Sam roasts up a few pounds of sweet potatoes each week and then uses the leftovers as a quick breakfast or lunch side dish. Mmmm. They're also great in soups, casseroles, and you can even add the puree to muffins and hummus. Store them for a week or more in a cool, dark, dry spot - not in the refrigerator. While it is possible to grow sweet potatoes in New Hampshire, it's not easy. So, sweet potatoes are rarely a local option in produce, but they're still a good starting point to enter into the diverse world of root vegetables. Celeriac (Celery Root): This thing looks a bit like a goblin baby and certainly not like something you'd want to eat. But you'll be surprised! It has a mild, smooth flavor with a hint of celery and creams up nicely with a texture that surpasses potatoes. You won't even recognize it in a soup, but you can really show it off as a mash or puree with a fancy cut of meat on top and some gourmet greens to the side. Also try it roasted and in other standard root vegetable-type recipes. You'll want to peel it first, possibly with a knife. Whole roots store well in the fridge for at least a week. Parsnips: These white, carrot-y veggies really don't jump out at you from the shelf. But, I strongly recommend giving them a try. They're a tad sweeter than carrots with a more pronounced flavor that begs to be combined with fresh-grated nutmeg. One of my most memorable recipes is of fresh, spring-harvested parsnips braised in a bit of water with brown sugar and butter til they're just starting to get tender, then remove the lid and let the sauce cook down into a glaze and finish with the aforementioned nutmeg. Heaven! Opt for smaller parsnips, which have better flavor, and remove the woody core if it seems necessary. Parsnips also do nicely roasted, pureed, in soups, the usual. Beets: When I first began working in natural food stores in college, I only ate a few vegetables: carrots, corn, potatoes, and iceberg lettuce. I remember one of my fellow cashiers coming through my line with a bag loaded with beets. "How do you cook them?" I asked. "Any way! I just LOVE beets!" My memory of beets was pickled at Sunday dinner on my grandparents farm (next to the gray green beans and pitcher of "chocolate" milk made with one spoonful of Quick). 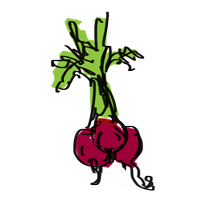 I'm happy to say that over the past decade+, beets have become one of my favorite vegetables. Try cutting them into quarter-inch matchsticks and roasting them at 420 degrees in a bit of oil until they reach the perfect stage of crispy and flavorful (but before they reach that unfortunate state of burnt). No salt, pepper, or other seasonings needed. It's a great accompaniment hearty autumn/winter dishes or placed atop greens with goat cheese and a squeeze of fresh citrus. You can also roast beets whole, let them cook slightly, then peel and slice them - they store well this way to toss with salad or other dishes. Also try grating fresh beets (solo or along with a bit of carrots and radish or daikon root) for a colorful salad; dress it with sweet citrus juice or maple syrup and toasted sesame oil, topped with toasted sesame seeds. I prefer red beets for their insanely gorgeous hue, but golden beets work better in dishes that you don't want everything stained red. Beets will store for weeks, if not months, in the fridge, but they will lose flavor and sweetness over time. If your root veggies come home with the greens still attached, it's a great sign that they're fresh, but you'll want to remove the greens before storing the roots. They'll keep and taste better. Save the greens for cooking, too! Beet greens are like chard, turnip greens like mustard greens, and celery, well... you can probably figure that one out. Store your root vegetables as dry as possible. Almost any root vegetable can be roasted. Toss it in an oil that will withstand high temps (like organic canola or grapeseed), lay them out on a baking sheet with adequate spacing, season as desired, and cook at 420 degrees, tossing occasionally, until caramelized and tender (about 20 minutes). What Do I Do with Leftover Herbs?